Bothwell Castle is a large medieval castle in Scotland. It is sited on a high, steep bank, above a bend in the River Clyde, in South Lanarkshire. It is located between Uddingston and Bothwell, about 10 miles (16 km) south-east of Glasgow. The castle was built in the 13th century by the ancestors of Clan Murray. It was built to guard a strategic crossing point of the Clyde. 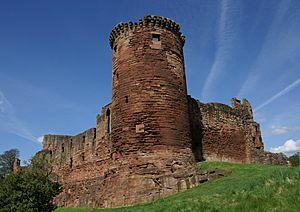 Bothwell played a key role in Scotland's Wars of Independence. It changed hands several times. Bothwell Castle Facts for Kids. Kiddle Encyclopedia.